Designed for C2/C3 Equipment. 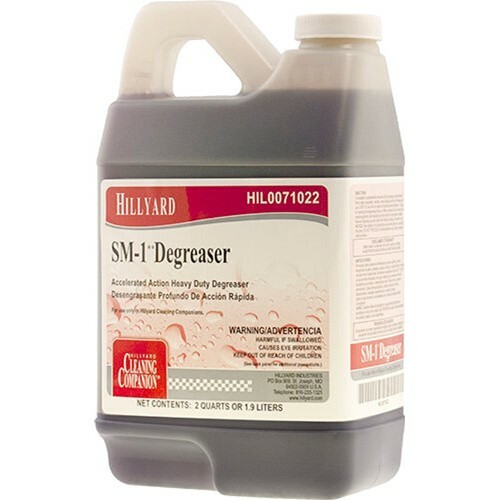 SM 1 is a concentrated industrial degreaser designed for todays hard to remove soils. SM 1 is the perfect choice for tackling a variety of tough to clean surfaces. Use SM 1 on concrete floors, air filters, exhaust hoods, walls, machine parts, and more. SM 1 was formulated with Accelerated Action Technology. Accelerated action means that SM 1 can do the job in less time than traditional degreasers, and more economically. SM 1 is also heat stable to 180F which can improve cleaning efficiency and allow it to be used with heated high pressure equipment. NSF Category A1, A4. With SM 1 you get superior degreasing performance without butyl or high VOC levels that are often found in many industrial degreasers. Dilution rate 5 oz per gallon. Formulated with Accelerated Action Technology to work faster. Superior degreasing performance without butyl or high VOC levels. Certified for NSF Category A1, A4.